Can’t open that door or window because the lock or hinges are broken or seized-up? Do you have gaps at the side or top of your window opening? Don’t worry… all you need is a WindowGeek! Locks, handles and hinges are little things on the face of it. We hardly give them a second thought when they are working well. We just pull and tug and twist them, hundreds and thousands of times. It’s no wonder they get a bit worse for wear. It starts small enough – a handle catches, or becomes stuck. A lock needs a certain amount of delicate handing. But before long you daren’t open the window because you can’t shut it or you have to spend ten minutes longer on the doorstep each morning, securing the house before you leave for work. Why put up with it when you don’t need to? We can replace a single failed part whether that’s a faulty lock, droopy handle, worn out hinge, patio wheels, broken letterbox you name it. We can find a match for the rest of your handles or offer you a range of new styles or colours for an instant window or door face-lift too..
We’re able to fix most all common lock, handle and hinge problems, quickly, easily, and for less than you’d expect. With over 40 years’ experience in the glazing industry; WindowGeeks offer you a cost-effective solution to all your window & door problems; with no pressure sales we can probably save you hundreds of pounds by simply replacing your faulty window and door locks, handles or hinges! Many traditional window and door companies often persuade you to change the entire door or window because a repair isn’t always their most cost effective solution. But that could cost you hundreds or sometimes thousands of pounds. 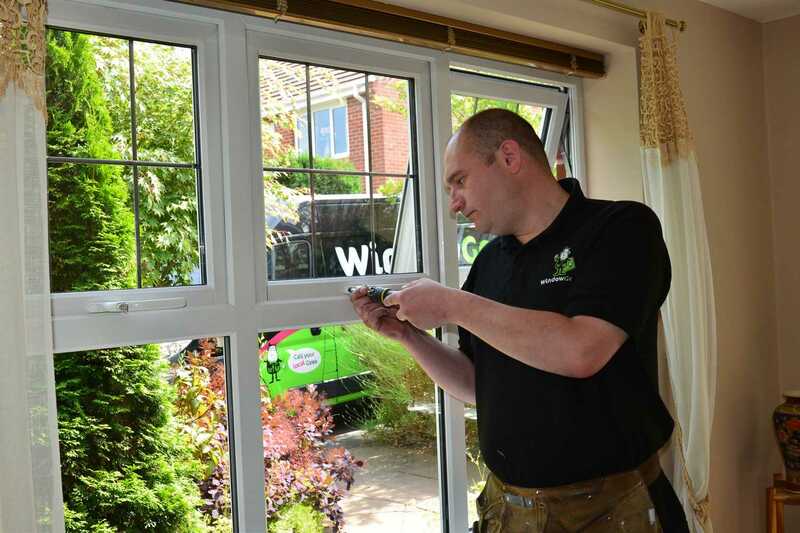 Wherever possible WindowGeeks provide a high-quality, cost-effective alternative to replacing the entire window or door because of a loose handle, seized lock or broken hinge. We can replace a handle from as little as £20 with a 2 year guarantee. There is no call out charge for visiting your home to carry out a FREE “No obligation” survey; We don’t impose a minimum order value or credit card charges either. So if you need a window or door repair or have broken handles, hinges or locks, call us now for a FREE quote on 0800 5 118 007 us the contact form here.